to be the next Mike Trout or Kris Bryant. catch Bobby Thomson’s Polo Grounds homerun. for every lucky catch or slide or stolen home base. of gloves, you love every impossible cause. Winter here retreats slowly, edging away from the outfield, faded base lines, a weathered home plate covered in slush. 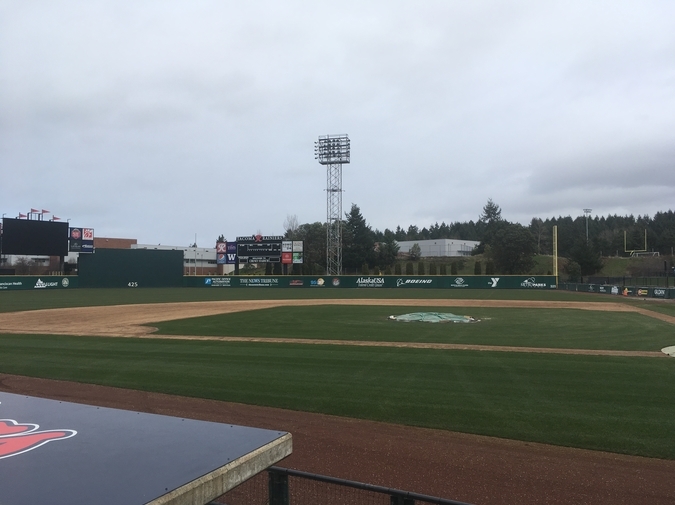 The pitcher’s mound, smoothed flat from heavy snow, is little more than a muddy circle, the chain-link fence, warped by wind and freezing rain, surrounds the field, sways and waves, hinges creaking. Someone last season lost a glove near the bleachers, the web torn, heel and palm smooth from hundreds of catches. Someone left baseballs in the outfield, every one sinking in the tangled grass and winter debris, every stitch slowly unraveling. But here, I can also find a dead doe resting near third base, its body bloated, stiff fur gray and thawing, its nose buried in what is left of the snow, but one ear perked forward, as if listening for cheers, for an umpire’s strike call, for the sharp crack of a ball against bat. with slingshots and small stones. its body tangled in grass and shoelaces. Karen J. Weyant is the author of two poetry chapbooks. Her work has been published in The Briar Cliff Review, Chautauqua, The Cold Mountain Review, District Lit, Harpur Palate, Mud Season Review, Spillway, Rattle, River Styx, and Whiskey Island. She is a Pirates fan, but don’t feel sorry for her. She loves every minute.